Need to spread ink or glue evenly for your DIY projects? With the Prozart Premium Hard Rubber Brayer Roller you can! High Quality Hard Rubber The high quality hard rubber is perfect for inking blocks and detailed carved surfaces for printmaking. Easily & evenly distributes ink or glue for presenting a cleaner, more detailed finish. Strong & Durable The heavy duty steel frame eliminates warping and damage saving you money on costly replacements. Solid Wooden Handle Crafted for Comfort Helps prevent annoying hand cramps for a more enjoyable rolling experience. Built to provide quality results Achieve professional quality results with a quality Brayer which is trusted by professionals. Best Value for Money Buy with our No Risk Money Back Guarantee. Order Now! Strong and durable heavy duty steel frame eliminates warping and damage saving you money on costly replacements. High quality hard rubber is perfect for inking blocks and detailed carved surfaces for printmaking. Easily & evenly distributes ink or glue for a smoother, cleaner professional finish. 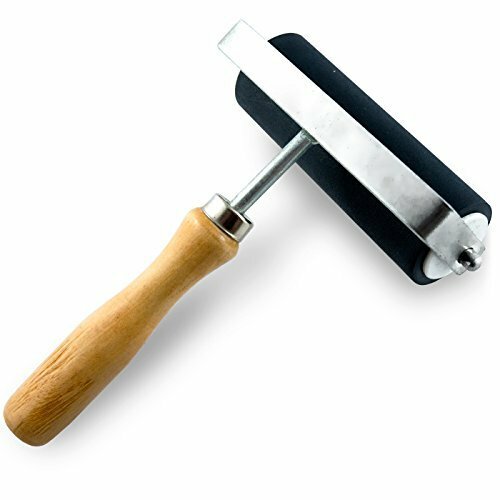 Achieve professional quality results with this quality rubber brayer, thats trusted by professionals and Artisans. Best value for your money. Buy with our No Risk Money Back Guarantee. Order Now! If you have any questions about this product by Prozart, contact us by completing and submitting the form below. If you are looking for a specif part number, please include it with your message.